​​​​​​​ HARRIS COUNTY – The county's increase in population from 4.2 million to 4.6 million from 2012-2017 corresponded with a burst of new construction in the county from 2012-2014. 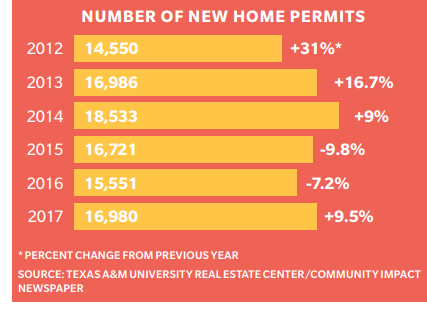 However, the number of new building permits issued for single-family homes has not exceeded 18,000 since 2014, according to a study by the Real Estate Center at Texas A&M University​. ​​Although new construction has slowed from its rapid growth pace, home prices have continued to climb. The average unit increased from $166,700 to $183,500 from 2012-2017, or 10 percent, according to the Center. ​Check out Houston-The Woodlands-Sugar Land Housi​ng Market Research.